Here’s a milestone – my 40th custom Indiana Jones figure! The sailor refered to as “Messenger Pirate” served as First Mate onboard the Bantu Wind, which Indiana Jones had hired to smuggle both him and Marion, and the Ark of the Covenant, out of Egypt and away from the Nazis. However, the Bantu Wind was intercepted by a German U-boat. The Nazis capture Marion and reclaim the Ark, but they were unable to find Indy. After the Nazis had left, Captain Katanga asks Messenger Pirate to search the ship for Indy, and the Messenger Pirate finds Indy stowing away onboard the departing U-boat. Actually, the inspiration for this figure came from Marvel Universe’s Luke Cage, which has a grey woollen cap that I thought resembled that worn by the Messenger Pirate. And so, perhaps I could customise the Messenger Pirate which could possibly wear that cap. 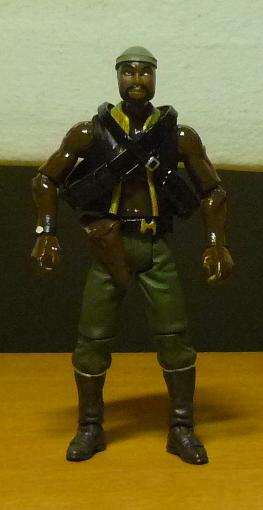 The Messenger Pirate figure would also nicely compliment the Captain Katanga custom that I had previously created. I found that G.I. Joe Roadblock‘s head most resembled that of Messenger Pirate, all it needed was an extra paintjob to paint the beard and moustache. I had bought Talon Karrde for use as possible custom fodder. In fact the arms, legs and belt were used for this custom. Especially the legs, of which the pants were already in the same green colour as worn by the Messenger Pirate, so there was no need for me to paint them. In addition, the belt had a clip buckle, just as seen in the movie. It turned out that the Luke Cage’s woollen cap was too large for the head, so the final cap was sculpted on using epoxy, with a plastic tie used for the brim. The Messenger Pirate wears a watch on his right wrist, which I created by using black tape for the strap, and a small round piece of paper for the clock face. 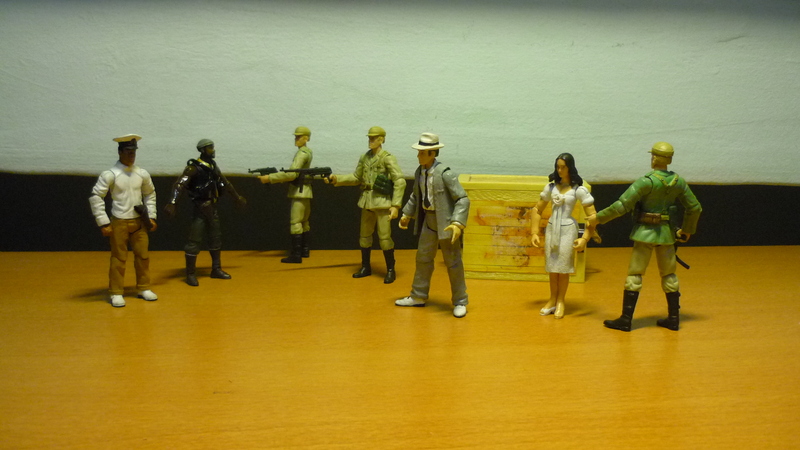 Belloq and the Nazis board the ship and reclaimed possession of the Ark. Facing overwhelming firepower, Katanga and his crew were unable to prevent the Nazis from taking Marion and the Ark away. Captain Katanga and Messenger Pirate cheer on as Indy stows away onto the German U-boat. And we have a special appearance by G.I. Joe Shipwreck (behind left), and Captain Jack Sparrow (behind right). 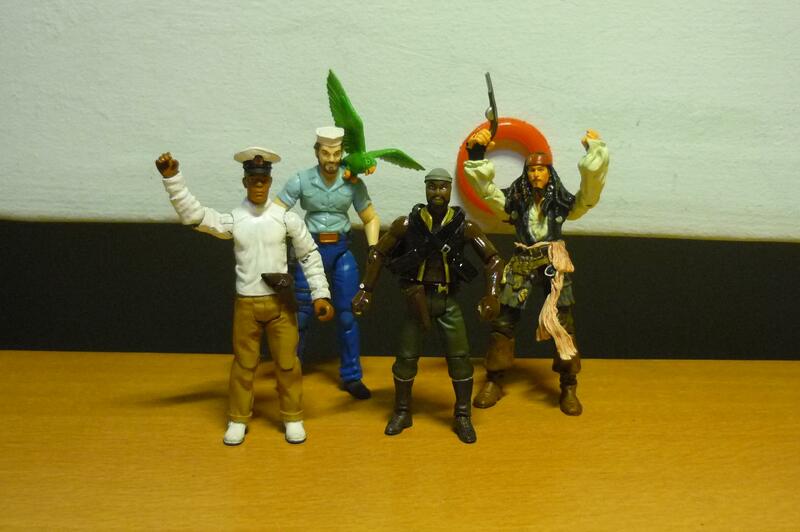 Since these guys are all a bunch of jolly seamen I thought I’d picture them together. Harold Oxley was an old acquintance of Indiana Jones, they had studied archaeology together years ago. Oxley had been obsessed with the legend of the crystal skull, and he had managed to find both the crystal skull and the lost city of Akator. However, Oxley had gazed too long into the eyes of the crystal skull and had gone quite mad. After Oxley was kidnapped by persons unknown in Peru, Mutt Williams sought Indy’s help in rescuing Oxley, whom Mutt had regarded as a father-figure. Upon Indy’s rescue of Oxley and Marion and their escape from the Soviets, Indy and gang arrived at Akator to discover its lost secrets. Oxley’s sanity was restored to him after the crystal skull was returned to its rightful owner. Head – A collage of Captain Antilles’ face (“Star Wars Episode IV: A New Hope”), Anakin Skywalker’s scalp (“Star Wars Episode III: Revenge of the Sith”), and bits of Willie Scott’s locks (“Indiana Jones and the Temple of Doom”). Most of my inspiration to customise Indiana Jones figures come from this Indiana Jones online forum, where fans discuss and compare their creations. Sometimes the recipe for figures are posted for all to share, but at other times I have to come up with the recipe myself, based on what parts I can recognise from the pictures. In the case of Oxley, I have decided to use Captain Antilles‘ face as it has a rather wrinkled forehead, together with a bewildered look, similar to Oxley’s “disheveled old man” appearance. Anakin Skywalker‘s scalp is used for its long hair, complimented by extra locks of hair from Willie Scott. The whole head is held together by super glue and epoxy, with epoxy used for sculpting the beard and moustache. 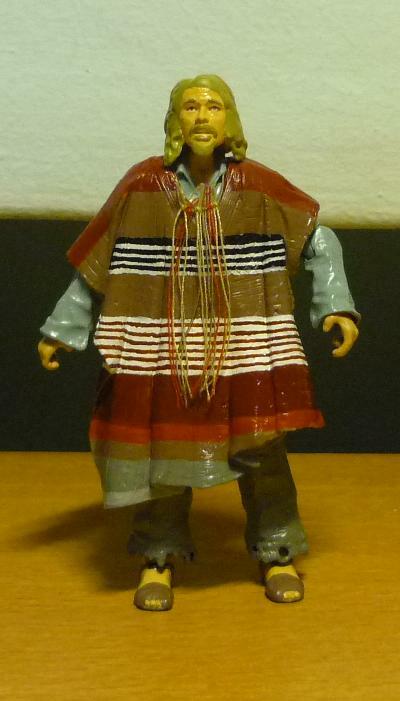 It was some time before I realised that the poncho comes from another Anakin Skywalker figure. Being a stickler to details, I have painted the poncho to match the patterns as seen in the movie. The neckpiece is created by tying together several different coloured threads, again matching it to its onscreen appearance as close as possible. Epoxy was used to sculpt the sandal straps onto the feet. Indy and gang arrive at Akator, and Oxley compares the crystal skull with the mural of ancient aliens. 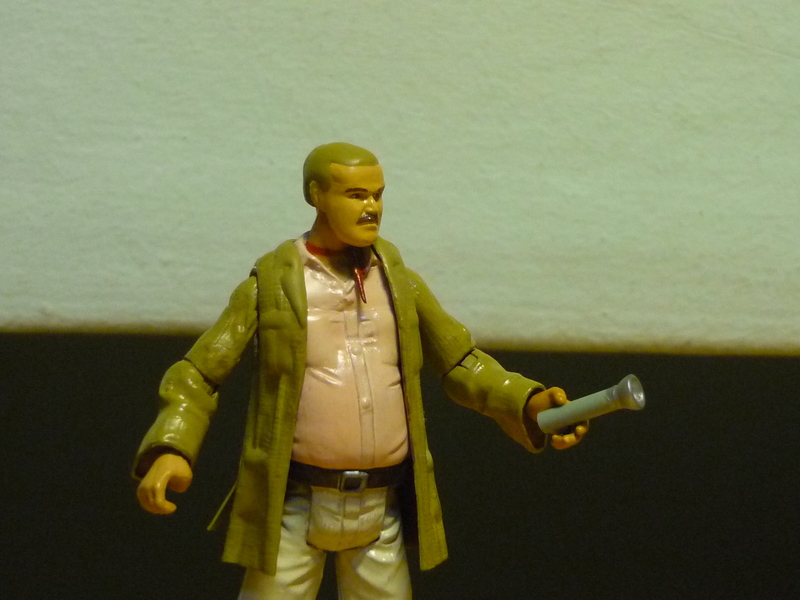 For the sufficiently sharp-eyed, Mac is holding his torch, an accessory that I have created by sticking the top of Padme Amidala‘s glass to a piece of plastic model kit rod.